As the spring semester treks on, many college students begin to think about their summer plans. What used to be an exciting break from school filled with long days by the pool, becomes an important time for college students to gain vital work experience. While you may have opted for a part-time job in high school, college brings forth another valuable option, the internship. This ultimately begs the question, which one is more valuable? Each choice has its pros and cons. So, figuring out whether you’ll get a job or internship, is largely based on what’s right for your future path. That being said, as you begin pondering your summer plans and sending out applications, consider these aspects of each. Unfortunately, in many cases internships tend to be unpaid. 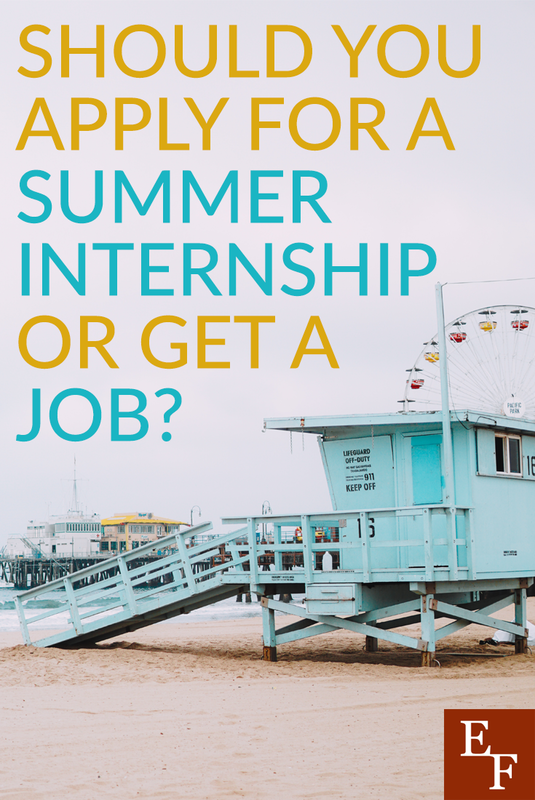 While this isn’t always the case, depending on the industry and company’s financial status, you may find that many of the internships you apply for are unable to provide compensation. A part-time job, however, will no doubt provide you with income during your summer break. Hence, you’ll have to decide whether or not you can or want to go the summer without earning any cash. On other ways to help you on your financial needs as a student you can try visiting loanforgiveness.org to give you some ideas. In some cases, you may be someone who needs to have a summer income, and if that’s the case, then a summer job is right for you. Does Your Resume Need a Serious Boost? Throughout the school year, there’s an array of organizations and on-campus positions and jobs that will all be valuable experiences to add to your resume. In some cases, you might find those opportunities difficult to work into your schedule. This could be true if you already work part-time and go to school. If you need a boost to your resume, especially depending on your graduation date, then an internship may be the way to go. No matter if it’s paid or unpaid, an internship can provide you with invaluable experience many companies will appreciate upon graduation. After all, an internship will likely look better than a part-time job as a waiter. One of the biggest aspects you should take into consideration is your long-term career goals. Even if you’d prefer to earn extra spending money or could use the surplus now, evaluate whether or not that summer job is going to benefit your potential career in the long-run. If you’re hoping to work as a reporter after graduation, then an internship at a publication or newspaper could be valuable. It’ll teach you skills and give you experience that could set you on the right path to accomplish that end-goal. A job as a barista, on the other hand, won’t likely set you up for said goal. Furthermore, many companies have a habit of hiring past interns. This is because they have been trained under their organization and they’ve seen the intern’s work already. Ergo, if you can land an internship with a company you love, you’re much more likely to be offered a position in the future. Are You Trying to Decide If You’re on the Right Career Path? There are those who instantly know what they want to do after college. But there are others who pick a major just because and aren’t always sure of their chosen career path. While classes provide you with useful knowledge, they don’t necessarily give you real-world experience. This is true in regards to what a career in your chosen field would actually look like. If you’re unsure of your major or simply want to see what life after college might really look like for you, then an internship is the way to go. An internship allows you to work in your desired industry and can give you a taste of your potential job. Moreover, it can also help you figure out what you like and don’t like to do within your field. This will give you direction post-grad. The fact that an internship is unpaid can bring about some hesitancy on your part. That being said, compensation doesn’t always have to look the way you might think. Many schools and organizations accept internships as school credit. Although that might not seem as enticing as cash, gaining school credit for an internship can put you ahead of schedule in terms of classes. It may also save you money in the sense that that’s one less course you’ll have to take later. Ergo, an internship will not only provide valuable insights and experience, but could save you money as well. Even though a summer job might not be in the exact field your hoping to enter into, it can still teach you important experience. Depending on the job you choose, a paid position can help you develop time management, social, and communication skills. Furthermore, you’d be surprised what kind of extra skills and insights a summer job, even a somewhat random one, could provide. These skills may be ones that an employer might find valuable as well. This is especially the case if you find a position that in some way relates to the industry you’d like to work in. As mentioned earlier, an internship has the potential to give you a leg up come graduation. In a sense, an internship is a way to work in a job position that you’d really otherwise be unqualified for. It’s an opportunity to get hands-on training. Plus, you can hone some of the skills you’d need for that position, and gain a mentor in your field. And again, by interning with a company you’d possibly like to work for, your potential employers will ave the opportunity to observe you, your work ethic, and skills. In the end, you’ll be much more likely to land a job, as they’ll already know you. Your summer break can be one of the best opportunities to gain relevant and beneficial experience. Internships and summer jobs each have their benefits. So, no matter which one you choose, you’re guaranteed to profit from the experience. Consider what’s important to you and your long-term career goals to pick the right path for you. What are some summer jobs that might directly or indirectly relate to your major or field? What are some of the invaluable skills an internship could provide you with?